Bighorn Sheep Sucker Fish and Frogs disappearing; part of Yosemite Paiute daily life. Recently there were stories in the news about Mountain Lions hunting and diminishing the struggling Bighorn Sheep population in eastern Yosemite through out Sierra Nevada. Both Bighorn Sheep and Mountain Lions have been struggling to survive in a diminishing environment as humans encroach on their ever shrinking territories. Hopefully both species can thrive together and continue to grow and not end up on the growing list of animals that have gone extinct. During the time when Paiutes and Mono Paiutes roamed the Sierra Nevada the Bighorn Sheep were abundant and we hunted them seasonally. The father of the modern day environmental movement, John Muir, documented Yosemite – Mono Lake Paiutes tracking and hunting Bighorn Sheep around Yosemite. 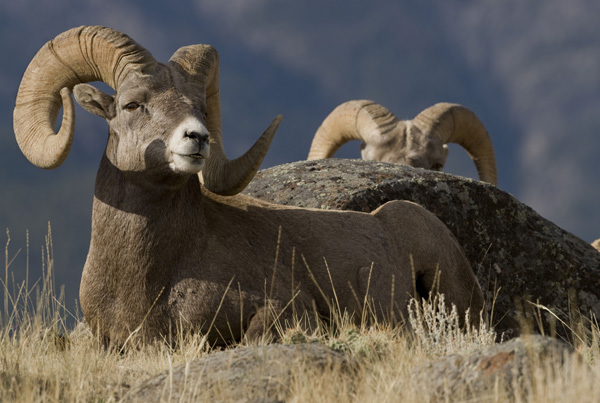 Now the Bighorn Sheep are in danger of disappearing. It would be a sad day if the Bighorn Sheep disappeared forever. 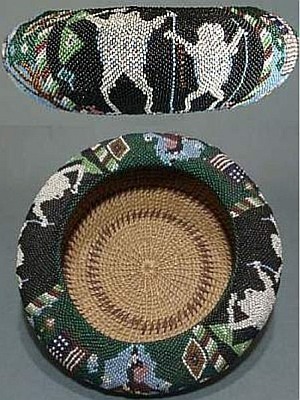 Years ago we Paiutes lived and knew this animal very well. In fact Koip Peak, Koip Pass, and Koip Ridge are named after the Bighorn Sheep. In his book The Discovery of the Yosemite by Lafayette H. Bunnell he wrote about the Ahwahneechees “That nearly all were descendants of the neighboring tribes on both sides of “Kay-o-pha,” or “Skye Mountains;” the “High Sierras.” Tenaya’s band was made up of Paiute, Mono Paiute, and Monache Indians who were outlaws from different Paiute bands. Bunnell’s “Kay-o-pha” is “Koip”. 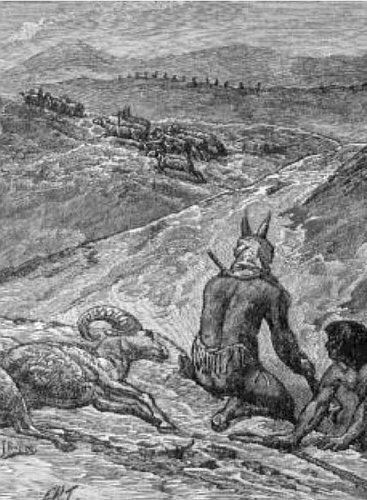 The Paiute people used to give places names after animals or plants in the area. Sometimes the place in question looked like the animal, in one case the amphibious frog. 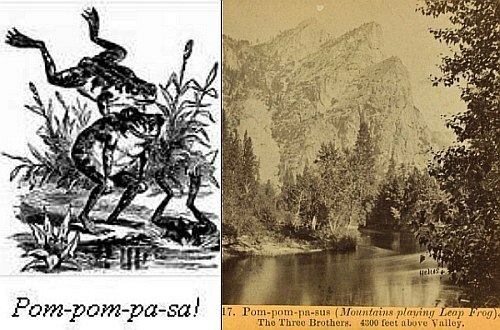 Drawing of frogs playing leap frog titled "Pom-pom-pa-sa" from on Yosemite book, Photo of Yosemite's Three Brothers by Eadweard Muybridge with Paiute name "Pom-pom-pa-sus"
Native fish in Yosemite are also struggling to survive and there are two fish located around the Yosemite and the Sierra Nevada that are disappearing or struggling. They are the Paiute Trout named after our people, and the Sacramento Sucker fish. At one time the Sacramento Sucker fish was one of the only fish to have lived in the higher elevations of Yosemite. The Sacramento Sucker now lives mainly in lower Yosemite, but the introduction of non-native fish has been disastrous to the native fish. Tahoe Sucker fish with Paiute name for Sucker fish which is "Ah'wa'ago" which means "Fish with wide gaping mouth"
So this Yosemite-Mono Lake Paiute person is sadden to hear that the Bighorn Sheep are struggling to survive since they played an integral part in the lives of Paiute and Mono Indians, as did the other animals, frogs, snakes, fish, birds and Native plants now also fighting to survive in Yosemite. As Yosemite-Mono Lake Paiutes we can relate to these endangered species as the native indigenous people of Yosemite. Like these natives species we are also struggling to survive in the Park as we face eradication and extinction of our people from the history of Yosemite National Park. Also you can try to write out Paiutes from Yosemite, but you cannot erase the Paiute meanings to many place names in Yosemite.